I visited my psychiatrist yesterday. It was mainly a visit for my Bipolar Type 2. Obviously, I wasn’t doing well or I wouldn’t need to be there. SHE GAVE ME A REALITY CHECK on how the way I take care of myself affects my mental health. She provided me with research that shows people with bipolar disorder die 10 years earlier when they don’t take care of themselves through proper diet, exercise, and habits (getting enough sleep, keeping a schedule). THIS SCARED THE CRAP OUT OF ME. The problem I have is that growing up with ADHD and Bipolar Disorder I have been unintentionally made to feel like a worthless outcast. Feeling different makes you grow to hate yourself. So why would I be able to take proper care of myself when I don’t think I deserve it. I eat like crap, I hold an irregular sleep schedule, and I never feel well enough to work out. But two of these things I know I can change. THE TWO THINGS I CAN CHANGE are my habits that I keep and my exercise plan. I can start getting on a more regular sleep schedule, making more time to clean up my living space, and stay on a regular schedule so I can ensure that I get all the things I need out of the day—that I don’t skip anything important. I can also start exercising more often. My psychiatrist said it needs to be a minimum of 30 minutes three days a week. Even if the exercise just involves walking, it’s still getting out of the house and making yourself move around. It can be hard to do, especially when you are depressed and feel like you can’t do anything at all. But eventually, if you make it a routine, you’ll feel amazing (supposedly—more on that later I guess). THE ONE THING MAY NOT BE ABLE TO CHANGE is my diet. Now I’m being realistic with you. It’s not like I snack on potato chips and ice cream every day. Nor do I drink copious amounts of sugary drinks. But I definitely do not get enough fruits, vegetables, unprocessed meats, and unprocessed diary. I eat far to much gluten (which is bad because too much means the microbes in your stomach are on overload and they actually have a big say on your emotions and mood), and I don’t take vitamins. WHY I DON’T HAVE A PROPER DIET has a simple answer. I simply cannot afford it. Fruits vegetables, and unprocessed foods are expensive. Eating gluten free is pricey. And vitamins seem like a luxury. Being 23 and living off an entry level salary I cannot afford to eat healthy. Other people my age who make even less money than me can say the same thing. However, their inability to eat healthy may not be life or death in their particular situation. If I don’t start eating better I can’t feel better—or I could feel even worse. Heart attacks, strokes, and suicide are not uncommon occurrences for people with Bipolar Disorder. This could be me. MY OPTIONS are minimal. I have to pay rent of course, I need to pay my bills, I need to save money, I need to, I need to, I need to . . . There’s so many demands on my salary it drives me insane. The last thing I think about is eating healthy. I attempted to apply for food stamps. I was denied. Why? Because my salary was above the poverty line. In order to receive food stamps you basically can’t have a savings account, you can’t be able to pay your bills, and you can’t even be able to afford unhealthy food. I am blessed that I can afford all of these things. But I am not blessed in the fact that if I want to feel better, and basically stay alive, I need to start eating healthy. The reality is that food stamps, at this moment in time, are my only access to healthy food. In Michigan, an EBT Bridge Card (the card you take to grocery stores to purchase food) works at not only super markets but whole food stores and farmer’s markets. I can only dream of shopping at whole foods and farmer’s markets. It just upsets me that mental health is not factored in to many disability cases where outside help is greatly needed. Mental Health disorders are an invisible disability that, in some cases, are debilitating. Many insurance plans don’t cover behavioral therapists and psychiatrists. Many companies do not have disability benefits in place for people with cognitive disabilities like ADHD or mental disabilities like Bipolar Disorder and Depression. I feel that people who struggling for their lives every day because of these conditions should have the ability to seek assistance. It seems kind of screwed up that they are, many times, denied that. Now I’m not saying everyone needs assistance, but wouldn’t it be better that it was there when someone needed rather than not being there at all? WHAT I HAVE TO DO. 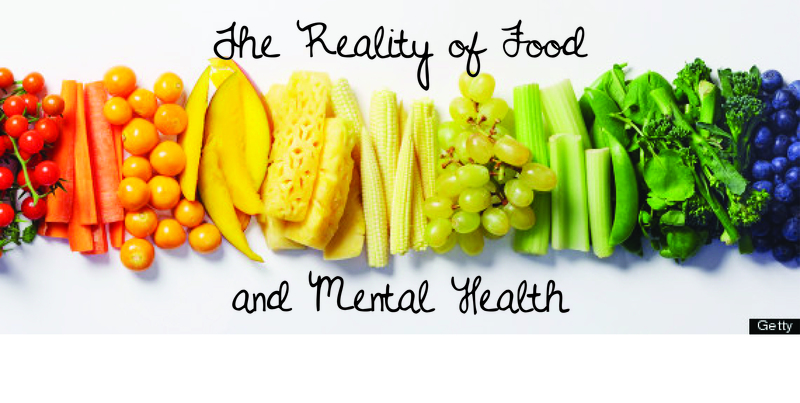 Essentially, if I want to live a better life—one where I’m not constantly depressed, manic, hypomanic, or overwhelmed—I need to pay for healthy food. Healthy food for two weeks can cost a little under $200. Imagine a person on an entry level salary who after paying expenses, putting money in savings (saving for retirement can never start too early), paying bills, and paying for groceries will have about $150 to live on for two weeks. I mean they can do it, but when they factor in gas and unexpected expenses—that amount drops dramatically. But if they have a mental health disorder, heart disease, diabetes, or a serious illness—then they literally have no other choice. Again, if people like me want to stay alive and happy, we have to do this. Because we have no other choice. This article honestly brought tears to my eyes. It’s so comforting to know that there are understanding parents out there who love their ADHD kids enough to let them choose what’s right for them, even if it’s not the choice they would’ve made. That’s true love. I’ve learned to let Lee take the lead on whether college is right for her. I’m really trying to adjust my diet to manage my ADHD. Except I don’t really know where to start. Or even what is missing in my diet that worsens my ADHD symptoms, or just leaves them untreated. This article definitely helps to give you a jumping off point. And I’m sure you can go to the comment section to see if author has any more recipe suggestions for your next ADHD-friendly meal :). IN THIS BLOG POST I’ll talk specifically about my main environment I organized to be ADHD-friendly: my bedroom. I say this is my “main environment” because this is where I spend most of my time when I’m at home. I’m going to be honest with you—I’m just getting out of college so I moved back in with my parents until I save up enough money to live on my own. Perhaps one day I’ll write a blog post about my journey of organizing my apartment to be ADHD-friendly. But for now, let’s focus on how I organized my current bedroom to be ADHD-friendly. BEFORE WE CONTINUE with my organizational process that follows up from my last blog post (Organization for ADHD: Part One), let’s discuss Feng Shui. I am a big advocate for Feng Shui. Why? Because I’ve seen its positive effects. Yep, that’s right! I lived at Michigan State University for four and a half years. Three of those years I live in a space that was not “Feng Shui-ed.” And then I spent one and a half years in a space that was “Feng Shui-ed.” During the non-Feng-Shui years, I had a very difficult time in college. However, during the Feng Shui years, my time in college was so much better, and much more manageable. I was happier, more energized, positive, and best of of all—I felt in control. It seriously felt like a night and day difference. I WANT TO TALK ABOUT FENG SHUI as it relates to ADHD organization because I honestly believe it creates a more positive, stress-free environment for those afflicted with ADHD. I don’t want to bore you with an incredibly long list of all the resources I referenced to Feng Shui my living spaces. Instead I’ll provide you with a link to my Pinterest board, which focuses on Feng Shui. MY OWN FENG SHUI TIPS are pretty basic. They are definitely covered in the proverbial “Feng Shui 101.” However, I do want to warn you—there are things that are no-no’s in Feng Shui that I choose not to pay attention to. But here’s the thing, because I live with my parent’s, my room has to store all of my things (clothes, items for hobbies, books, etc.). And because of that, I’ve had to make some Feng Shui sacrifices in order to achieve a desirable living space. For instance, storing things under your bed is a Feng Shui no-no. However, I put my bed on risers for the sole purpose of creating extra storage space for my arts and crafts supplies. And some Feng Shui resources say you shouldn’t put your books in your bedroom—or that you should only keep the ones you’re currently reading in there. However, I have to keep my books in my room because I do not have the ability to store them elsewhere. So my suggestion is to take Feng Shui tips with a grain of salt, and adapt them to your lifestyle. The bed should be in direct view of the door, however it should also be as far from the door as possible. This gives you a sense of safety and easiness while resting. The bed should have a sturdy headboard to create a sense of stability. However, if you don’t have a headboard you can position it against a wall. Make sure your bed is a good height, don’t put the mattress, box spring, or frame directly on the floor. The frame of your bed should have legs. And if you desire you can use risers to increase it’s height. Having your bed off the floor creates a sense of flow and control over the bed, and the space itself. Electronics in your bed room should be limited, if not non-existent. If you absolutely must have them in your room cover them up when not in use. For instance, I have cover that I made for my sewing machine. And I just cover my cellphone up with a washcloth when I go to sleep. Doing things like this makes sure that your peace is not disturbed or distracted when you are trying to rest, decompress, and rejuvenate yourself. Use natural lighting as much as possible during the day. That means opening your curtains and blinds. When you must use artificial lighting, opt for soft lighting. I personally need a lot of light in a room to focus clearly, and not get sleepy again in the morning. So I have as many lamps in my room as possible. Hanging a crystal by the window can make a space feel more open and positive. Plus it looks so pretty when the sun hits it and casts little rainbows all over your room. Place inspiring art and wall decor in your bedroom. This will create positivity and confidence in your life. Use the Feng Shui colors for each part of your room. That is, your room is divided up into elements (i.e., wood, metal, earth, water, and fire). Each area that is represented by one of these elements has specific colors associated with it. Try to incorporate those colors into your decorating. You can find more information about the elements and colors on my Feng Shui Pinterest board. At the front left of my room is my sewing table. Along the left side are all the boxes where I keep my craft, sewing, and knitting supplies. Along the back wall on the left side and above, are my bookshelf and a ledge that runs along the entire back wall, where I store the rest of my books and other knick-knacks. Along the back wall to the right is my night stand and a crate on the floor where I put recycling. My closet is inset along the right wall. And there’s a screw-in coat rack along the front right side wall. Under my bed I store more craft, sewing, and knitting supplies. Finally, within my closet I store my clothes, shoes, accessories (i.e., bags, belts and hats), and camping gear. My bed, which is placed in the center of the room so I can walk all the way around it. It makes it much easier to make my bed in the morning, and creates flow throughout my room. My sewing area has all my sewing equipment and books that I use on a regular basis. I also sometimes store my current knitting project here too. I keep my inspirational visuals in this corner of my room. They include Wonder Woman and Disney Princess Belle (two feminists lol), I also store my jewelry here, out in the open, so it’s easily accessible. So You’ve Feng Shui-ed and purged . . .
NOW that you’ve purged your room (more on that here) and feng shui-ed your room, it’s time to divide your room into little areas. Think of your room like a government building, every department has their own area. Apply that thinking to your room, every item is grouped together by the task or activity it serves. For instance, in my room, I have different areas for clothes, books, crafts, sewing, knitting, and laundry. And within those areas I have sub-areas. In my clothes area, I have my closet divided up by clothing type. Leggings go on one shelf, blouses hang on the rack in a marked space, and tights get their own plastic milk crate. I did this for my craft area and my book area too. Most importantly, I LABELED these sub-areas. In my closet, drawers and shelves are labeled with Washi tape and permanent marker. I label the tape and place it on the container with the items that occupy its interior. Because I don’t Have a ton of drawer space, I double up some drawers and made a cardboard divider to separate the different items. I have Sterilite plastic tubs labeled with erasable white board marker indicating what’s inside (e.g. tank tops, t-shirts, pants, shorts, work-out attire, etc.). You can find some of the tubs I used here. But remember I measured my shelving and found specific tubs that fit those dimensions. So you may have to buy different tubs in order to fit your closet space. I choose NOT to fold my clothes? Why? Because I have a lot of them (and clothing is one of my passions so I have a hard time being a minimalist when it comes to that). Plus it makes the process of putting clothing back in it’s place a whole lot easier. If something is too wrinkled to wear I just use Downy Wrinkle Release Spray and toss it in the dryer for a few minutes with a dryer sheet. I keep the shoes I wear most often outside my closet (i.e. my slippers and flip flops) and then I line up the rest of my shoes like little soldiers, grouping together type and frequency of use. Because I have so many heels for work I just went ahead and stuck them in a plastic milk crate. Probably a little harder to get to my shoes easily, but I love my shoes too much to get rid of them. I label all my bins with erasable whiteboard marker. And because I do that, I can change the labels based on the season. For instance, when summer rolls around I can swap out my “Hats, Scarves, & Gloves” label for something else that I’ll put in that bin. The author of Organizing Solutions for People with ADHD, recommends that you use these types of plastic stackable storage bins (seen below). However, when I was buying for organizing my closet space, I couldn’t find these anywhere . . . not even on amazon. I believe that they are more popular now, so if you so choose, these can be an alternative to my Sterilite plastic storage tubs. 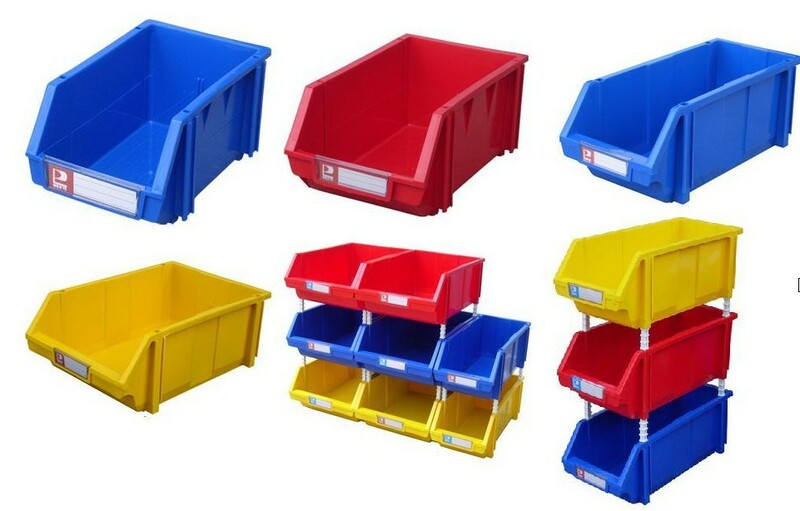 These bins that the author suggests are a little easier to deal with because they don’t have tops on them. So you can just toss your clothes back in the container and not having to worry about putting a lid back on. 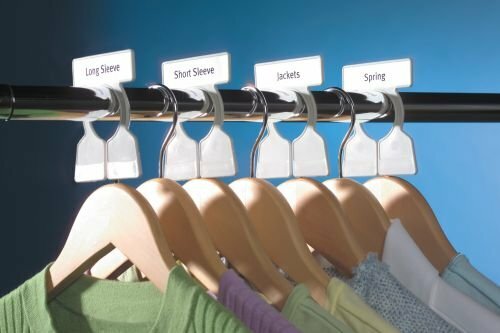 The racks in my closet have plastic closet dividers with names as to what kinds of outfits the clothes are for (e.g., work, casual, evening, etc.). I got my closet dividers off of Amazon.com, you can find ones like them here and here. And here’s a DIY tutorial on how to make your own closet dividers! 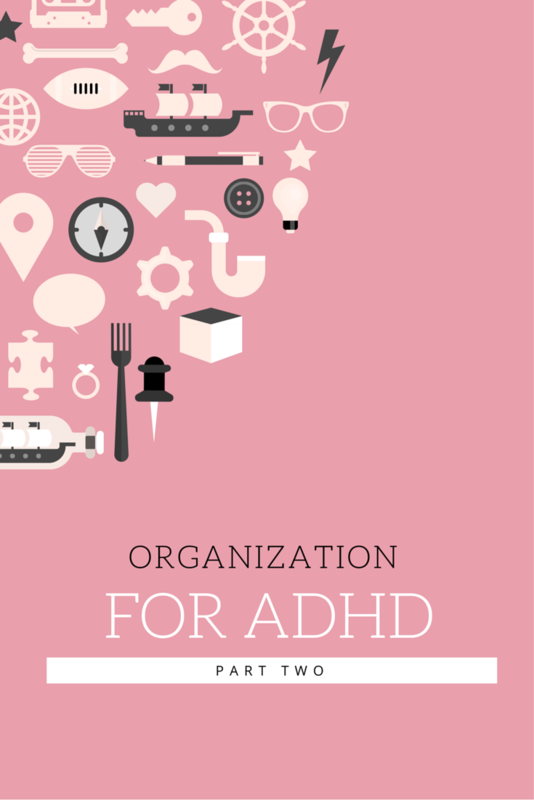 ORGANIZING FOR MY ADHD has made my life so much easier. And I am not exaggerating, in any way. I can always can find what I’m looking for. Clean up is a snap. And the stress in my life has been significantly reduced. Bottom line, the organization system I have instilled in my life, just for my bedroom, makes me much happier. When I’m in my room now, my mind is clear and I’m free to go about my tasks with little to no difficulty because it is so much easier to focus. When my room was messy and disorganized it required so much energy and focus to remember where things were and then go and look for them. I am so, so, so happy that I found this organizational system because it has completely revolutionized my life. NOW IT’S YOUR TURN! Try out this or a similar organizational system in your bedroom, give it a month or two to get use to it. And then evaluate the results. You may have to adjust how you do things in order to fit your lifestyle, but that’s okay! Much of the process of managing ADHD has to deal with trial and error. Just don’t give up! Are you going to try out this organizational system for your bedroom? What ideas do you have about how you can adjust and, or, improve on the system I’ve presented to you? Share your input in the comment section below! You could think about the human mind like this: There are voices in your head telling you how to behave and carry on throughout the day. And they are all taking their turn, speaking one at a time, and in the correct order. You could think about the ADHD mind like this: There are voices that are in your head telling you how to behave and carry on throughout the day. But they’re all speaking at once, LOUDLY, without taking their turn, and definitely speaking out of order. HOLY CRAP THIS IS AN AMAZING ARTICLE! IT MAY BE A LITTLE OLD . . . BUT IT WILL ALWAYS BE RELEVANT! I TRULY, TRULY, TRULY RECOMMEND THAT ALL ADHDers AND THEIR LOVED ONES GIVE THIS A READ. IT’S ALL ABOUT HOW TO MOTIVATE YOURSELF (which is one of the hardest things to do when you have ADHD). THIS IS SOLID GOLD! This is a super awesome idea, and super important to do when it comes to managing your day-to-day life with ADHD. Give it a quick read, I promise you won’t regret it! I highly recommend editing your vocabulary and eliminating the words “should” and “have to.” As soon as we say one of these bad words to ourselves, we develop automatic unconscious resistance to doing the task. We really don’t need anything to foster our procrastination. But this approach, of being determined to eliminate the bad words, often leads to awkward sentence construction. I recently ran across a better approach. Eliminate the bad words, “should” and “have to,” and substitute “I get to.” This changes the whole thing. I get to carry out the garbage. I get to pay my bills. I get to write tomorrow’s blog. It’s a positive outlook. Your life will be better. What About the Quote of the Week? What is the Image of the Week? When you have ADHD, most days are far from perfect. 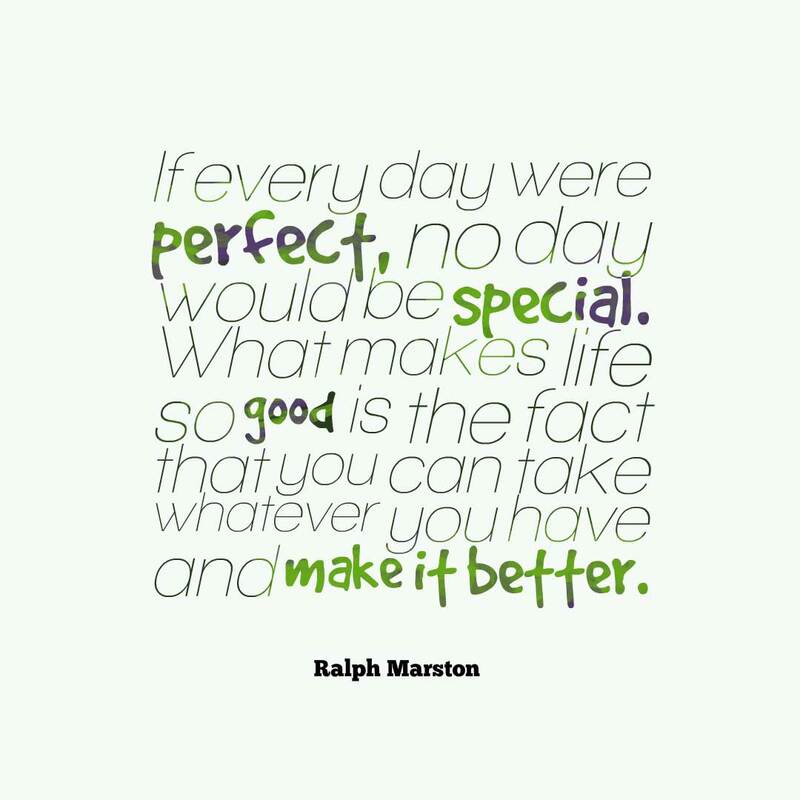 But with the right attitude you can every day better—not perfect—but better. When you have #ADHD it can be hard to know the "why" behind your daily perseverance. But if you figure out the "why," you'll then be able to know and begin on the "how"